In the never-ending process of optimizing a solution to a problem, everything matters, particularly the materials one uses to fix the problem. And the more complex the solution, the more advanced the materials. One has to choose materials that are perfectly suited to the address the problem at hand. Often, it is useful to employ composite materials, those that combine two or more separate materials to form another, with new and improved properties. Materials like these are used in things like batteries, solar cells, building materials, anti-stick frying pans and vehicles. The trouble is, they can be difficult and expensive to produce, so companies are always looking for a better way. 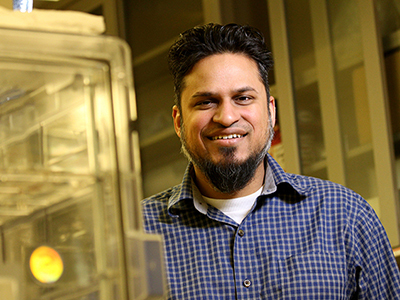 In his National Science Foundation CAREER Award-winning proposal, “Fabrication of Composite Material Structures Using Light-Induced Self Writing,” College of Engineering and Computer Science Assistant Professor Ian D. Hosein lays out his plans to use light to “write” composites at the microscale. This approach, also known as photocuring, provides faster production and greater control over the arrangement of materials in fabrication of composite material microstructures. Hosein’s method could unleash an incredible new range of beneficial chemical, mechanical and electrical properties in composites. How did you get into designing materials? I have always loved making new and advanced materials. It’s fascinating how simply tweaking their composition and structure can dramatically change their properties. As a chemical engineer, I’m motivated by how materials can have an impact on a wide range of applications. For me, doing this work is an opportunity to be immersed in a multidisciplinary field and collaborate with researchers from a vast range of specialties. Think of 3D printing. We’re trying to do the same thing, only we have a technique that transforms light into the “nozzle” through which materials are precisely deposited. But unlike 3D printing, which simply extrudes as single-component resin to write materials, our resin consists of multiple components. And we precisely control where each component is located. Our light-writing technique is also much faster than 3D printing, which has to build a structure layer by layer. Why is it important that this work be done? Making microstructured composites currently entails multiple laborious, energy-hungry steps, which drive up costs and don’t provide enough control over the arrangement of the composite. This has slowed innovation in the field of materials and the integration of new products into the market. Our process rapidly produces materials at a fraction of the cost and with unprecedented control. This could lead to a revolution in the way composites are made, allowing new materials to reach products and the market quicker. The process is also highly versatile. A wider selection of materials can be used, thereby providing opportunities for new and advanced materials to reach the product level. What do you hope this work leads to? I hope that we develop our new method to a level at which a wide range of composite material structures can be produced that can significantly impact a broad range of applications. I want researchers to see our work and say, “We can use that.” For example, I hope to see better battery materials, stronger and lighter construction materials and better coatings. I also hope that some of these accomplishments lead to commercialization of products. As this is an early career award, I also hope that it advances my lab to the extent where we continue to do cutting-edge work that garners recognition from funding agencies, industry, as well as our research community. How does it feel to win this prestigious award? I am excited that we have the opportunity, through the support and resources provided by this grant, to pursue this exciting research and to realize all that it promises for engineering and technology. I’m also honored that NSF recognizes the potential of this work, and also has faith in my research group that we can successfully achieved our research goals.